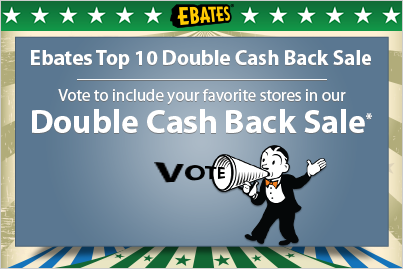 You vote, Ebates DOUBLES the cash back! It's that time of year again, folks! Every year Ebates offers members the opportunity to vote for the stores they want to shop, with a double cash back offer. Yes, that's right! Ebates - where it literally pays to shop your favorite stores online - is offering members the chance to cast their vote for a double cash back offer at their favorite stores! By signing up for a free Ebates membership, you will have the opportunity to vote for your favorite stores, PLUS you'll also have the opportunity to receive a $10 gift card, just for signing up*. *Offer applies to new membership sign-up's - see ebates.com for full details. Old Navy - Men's Sale - Everything up to 40% off! Hanes – Exclusive to Ebates! $5.99 Shipping. White House Black Market - 25% off + free shipping and returns on all swimwear. Disclosure: This post contains sponsored content. All thoughts and opinions expressed are our own. We absolutely LOVE ebates! Cash back to shop at all of my favorite stores online - that I would be shopping at anyway? Yes - of course! Seriously, it's a no-brainer!